The abandoned property located within the West Rancho Dominguez-Victoria Community Standards District, a.k.a Willowbrook, is secured by a padlocked seven-foot fence. The abandoned houses – boarded up and nearly hidden from view by tree branches and other foliage – have not been a known problematic haven for crime and vagrancy. Still it was cited as part of the criteria for the community losing an appeal in opposition to a proposed 55-unit low to very low income housing project where 70 percent of the heads of household will have a mental illness caused by drugs and alcohol abuse. In his closing statement, L.A. County Supervisor Mark Ridley-Thomas, a proponent of the project stated in part, “…the parcel on Avalon Boulevard…is currently a source of nuisance and blight…the proposed development would mitigate the existing adverse environmental conditions.” That sounds well and good, but to date some residents wonder if Ridley-Thomas has ever visited the site firsthand (which is in his [2nd] district). They also wonder – for a project of this magnitude – why he did not personally attend any of the community meetings. There is no record that he did. Conspicuously, the announcement ‘Supervisors greenlight affordable housing project for Willow­brook’ was posted on the internet with an artists’ rendering of the complex the same day the hearing took place on August 14. Was the hearing a sham or an empty formality? The story first appeared in the Los Angeles Sentinel (February 23, 2012) after developer A Community of Friends (ACOF) hosted a community meeting to introduce the project in January. During the meeting citizens were told of the plans to break ground by December 2012. One of the immediate concerns was that of the 150 notices ACOF sent out to residents, none were in Spanish for the benefit of the Latino population. Concerns about the ambitious plan and ramifications were raised and addressed, but in the end residents felt that ACOF was taking them for granted and had not done an adequate impact study. Subsequent community meetings were hosted by ACOF while a local group – Friends and Neighbors Community Club (FNCC) founded by Randy Hughes – mobilized a petition and garnered nearly 1000 signatures in opposition by the time the first hearing with the Regional Planning Committee took place in June. At the hearing the signatures went virtually ignored as the panel unanimously ruled in ACOF’s favor. It was noted that after listening to both sides, one of the commissioners asked that the hearing be postponed because there was no representation from the community’s 2nd District County Supervisor’s Office. An ACOF representative complained that if the hearing were postponed ACOF would lose out on tax credits in July, and would not qualify again until March 2013. The committee then unanimously granted the approval. After FNCC filed for an appeal, attorneys for ACOF sent a letter to the L.A. County Board of Supervisors requesting that the appeal be denied. 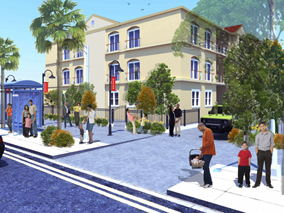 It read in part that “…the appellants failed to explain any reasons for the appeal other than to state: ‘Do not want the project in our community.’” Based on information obtained from the Regional Planning Commission, FNCC’s appeal in fact stated: “The subject property is zoned C-2 (Neighborhood Business) which does not have a specific density limit, although apartment buildings are allowed with a conditional use permit (CUP). It does have a General Plan land use category of ‘1 – Low Density Residential,’ which generally allows residential densities of between one and six dwelling units per acre. For this [proposed] site, which is 1.72 acres, it would normally allow 10 dwelling units. We understand the Housing Element of the General Plan also allows density bonuses for affordable housing projects. However, a density bonus of 550 percent will have an extremely detrimental effect on this community.” The appeal letter further drew a comparison to other low housing units in the vicinity: Jordan Downs – 700 units on 46 acres (15 dwelling units/acre); Imperial Courts – 498 units on 32 acres (15.5 dwelling units/acre); and Nickerson Gardens – 1054 units on 64 acres (16.5 dwelling units/acre). ACOF’s plan for 55 units on 1.72 acres equates to 32 dwelling units per acre − double the density of Nickerson Gardens. Also, in response to ACOF’s comparison to the Avalon Senior Apartments next door to the proposed site, FNCC noted the senior complex has only 42 units on 1.7 acres (24 dwelling units/acre), with a maximum capacity of 84 individuals. ACOF’s plan will have a maximum capacity of 234 persons most of which will be children. The attorney’s request was denied and the appeal hearing took place as scheduled. Although FNCC had done its research and presented sound data – this time armed with well over 1000 petition signatures – ACOF was again approved to move forward with the project despite evidence that a thorough impact study had not been done.